This Christmas, get together with family and friends and watch some Christmas classics and Christmas newbies that are guaranteed to bring festive cheer to one and all. Synopsis: It is Christmas time and the McCallister family are getting ready to jet off to Paris for Christmas with their extended family. But Kevin, (Macaulay Culkin), the youngest family member is in a very bad mood as he hates all his cousins being in the house and is tired of being pushed around by his bossy family. After a big outburst Kevin is sent to his room on the third floor and told not to come down until morning. Kevin who is very angry wishes that his family would disappear so that he can be all alone. Then, the next morning, the family wake up late and rush around trying to get ready in time for their flight. While they are outside and pilling into the taxis, they accidently miscount the many children and speed off to the airport without Kevin, who is still asleep upstairs. When Kevin wakes up he is very confused and wonders whether his wish has come true. At first, it is all fun and games as Kevin has the house, the fridge and the TV all to himself. In Paris, Kevin’s family panic when they realise their mistake and desperately try to get back home, but with the busy Christmas flights a problem, seeing eight year old Kevin again seems a long, long time away. But back at home, things go wrong for Kevin when two burglars, Harry and Marv, (Joe Pesci and Daniel Stern), set their sights on the McCallister’s big house, thinking it’s empty for Christmas. So when the crafty pair begin to scout out the house, Kevin makes an elaborate plan with intricate booby traps to protect his house and catch the baddies. Synopsis: A retelling of the classic Dickens tale of redemption at Christmas. The story follows the one and only Ebenezer Scrooge, (Michael Caine), a nasty, mean old miser. Every year Scrooge fights against Christmas and ignores the plight of his family and impoverished employees who are struggling to survive in Victorian London. But one night Scrooge is confronted by three ghosts who show him the demons of his past, present and future and urge him to change before it’s too late. So when Scrooge awakes on Christmas day, will he be changed? And will he be ready to embrace the true Christmas spirit? The Muppets’ adaptation of this timeless tale is not only true to the story, (minus the Muppets), but provides unique colour, comedy and musical entertainment. Synopsis: Inside a magical snowflake is the land of Whoville lives the Whos, a community of funny munchkin like people. All the Whos love Christmas, yet just outside of their tight-knit Whoville town lives the one and only Grinch, (Jim Carrey). The Grinch is a green, mean, Christmas hating being, who plots and plans to ruin Christmas and wreak revenge on the Whos for his unhappy past. But one day little Cindy Lou, (Taylor Momsen), climbs high into the mountain where the Grinch lives to pay him a visit, and slowly but surely, she changes his heart and shows him that Christmas really can be the best time of year for Whos and Grinches alike. Synopsis: One night when Buddy, (Will Ferrell), was a baby living in an orphanage, he managed to get into Santa’s present sack and wound up in the North Pole. 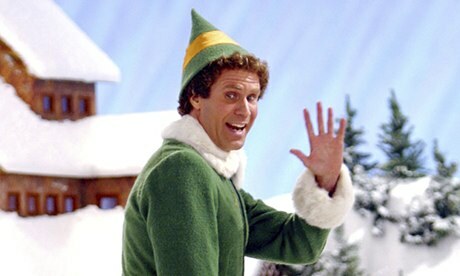 Buddy is then raised by elves and develops an overwhelming love for Christmas. But something is not right and even although Buddy loves his home, he knows he doesn’t quite fit in with everyone else. So one day, Santa tells Buddy to go to New York City to find his birth father, Walter Hobbs, (James Caan). Hobbs is very surprised and confused to meet Buddy who he never knew had been born and struggles to cope with this man sized elf following him around all day and clearly struggling to understand normal everyday life in a busy, modern city. But as Buddy spend more time with his father, he begins to show him how important family is and why Christmas is the perfect time to be close to those you love. Synopsis: This animation is the story of a young boy who doesn’t believe in Santa and who wants to find a meaning to Christmas. So one Christmas Eve a mysterious magical train pulls up and the boy is invited by a train conductor to go to the North Pole and see Santa. What unfolds is an adventure which follows a doubting boy, who takes an extraordinary train ride to the North Pole; during this ride, he embarks on a journey of self-discovery which shows him that the wonder of life never fades for those who believe. This film which is known for its spectacular animation stars Tom Hanks who gives his voice to seven different characters including the boy, the conductor and Santa. Synopsis: Arthur Christmas reveals the incredible, never-before seen answer to every child’s questions about Christmas and life at the North Pole. But Christmas with Santa and Co is not as jolly as one would think as the eccentric and dysfunctional Clause family push and shove each other around to be the top dog of Christmas. We have the decrepit and slightly mad Grandsanta, (Bill Nighy), the efficient and clever brain behind the Christmas mission, Steve, (Hugh Laurie), and the surprisingly lazy Santa himself, (Jim Broadbent). But at the centre of the story is an unlikely hero, Arthur, (James McAvoy), the second son of Santa who loves Christmas and has never forgotten its true meaning. But poor Arthur who has always lived in the shadows is faced with an urgent Christmas mission that he is determined to complete before Christmas morning, but the clock is ticking and the odds are against him. Synopsis: This might not be an actual Christmas film, but it has Santa in it, so it should count. The film begins with Jack Frost, (Chris Pine), who has been around for as long as he can remember. But he has no idea where he came from and who or what he really is. No people can see him and in an attempt to enjoy life he spends his time causing mischief and giving frosty fun to all the children of the world. But one day up in the North Pole, Santa, (Alec Baldwin), is given a shock when an old enemy, Pitch Black, (Jude Law), shows his face and threatens the happiness of all children. Santa, also known as North calls on his friends the Easter Bunny, (Hugh Jackman), Sandy, and the Tooth Fairy, (Isla Fisher), who also happen to be exclusively selected guardians for children by the man in the moon. When they assemble and it is clear that Pitch is not going away, the man in the moon selects Jack Frost as another guardian. But he and the others are unsure as to why he has been chosen and whether he can really fulfil his role, given his mischievous track record. But as Pitch begins to encroach upon the imaginations of children and sets out to corrupt their hopes and dreams, Jack must seek his purpose and bravely protect the children in his own unique way.